Knowsley Housing Trust (KHT) are sending out a standard letter which tenants are reading as pay your rent or social services will come and take your children off you..and you thought social landlords couldn’t get any more incompetent! The phrase in the above letter says that KHT will inform social services about your children and this has caused huge consternation and stress upon tenants who believe this means social services will take their children off them. The wording that your children are at risk is either ineptitude writ large or deliberate and if so then that is abuse! The letter does NOT mean that but it is appallingly written and IS a veiled threat of pay your rent or lose your children, which is an outrage and KHT must withdraw this letter with immediate effect and also discipline if not dismiss their communications director or whoever is responsible because of it. 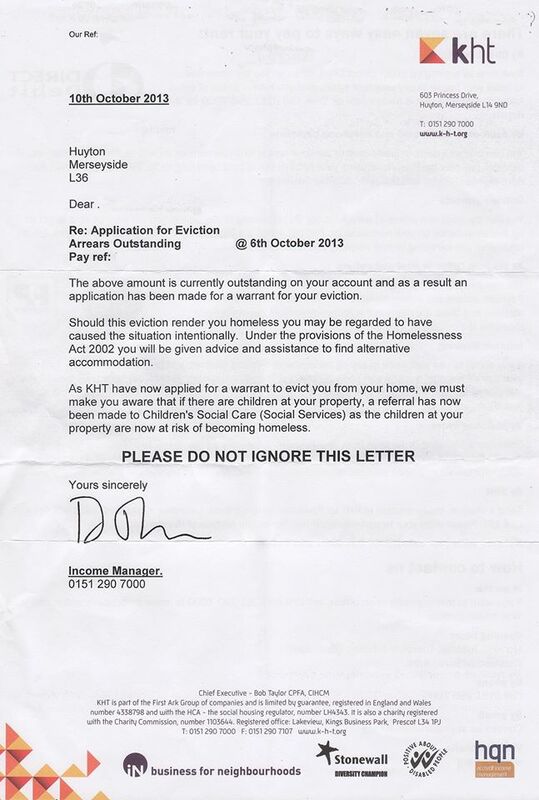 The prior paragraph sees KHT assume that any tenant evicted for arrears will be declared intentionally homeless by the council – that not paying your rent means you WILL be found intentionally homeless and that is a huge assumption and an overt scare tactic in itself by KHT and this predicates the threat of your children being taken into care. Councils have to look at the individual circumstances of each case under homeless legislation and eviction for arrears does NOT equate with being found intentionally homeless as KHT strongly allude it does. If a single person is found intentionally homeless the council will simply give the person a list of private landlord numbers and say phone them we have no other duty to you. However a homeless family with children (potentially those aged 21 and under not just 16 and under) are in a different legal position. Homeless departments at councils have to assess a homeless case for their duties towards – a homeless duty if you will. Yet additionally is children are involved then social services also have a duty to see that children are not left homeless or destitute. This caused all sorts of tension for years between social services and housing departments as both had duties towards homeless issues. The Southwark judgment clarified that the primary duty rests with social services when children are involved. What this means in practical terms is that if a homeless family is deemed to be intentionally homeless under the housing duty then social services have a duty to the children (and their parents) to rehouse and ensure they are not destitute. It does not mean social services only have to rehouse the children and not the parents. It does not mean that children will be taken away from their parents either. It simply means that the social services department rather than the housing. department have legal duties and responsibilities to rehouse you. Social services departments (SSD) don’t like this one bit and never have and there are incidents almost every week where SSDs refuse to carry out these duties and especially to 16 and 17 year old single persons who are still children under the law. So to keep this simple imagine a family with two parents and 3 children aged 10, 12 and 14 are evicted for arrears. The homeless service at the council decides they have made themselves intentionally homeless by saying they could have paid rent but chose not to. The homeless department has to inform the social services department who have an absolute responsibility to rehouse the children under various pieces of law and cant moralise or judge and say you have made yourselves homeless so we wont help you as the homeless duty allows. Social Services have no choice and have to help and provide accommodation or arrange for accommodation to be provided as this is the law. The Southwark judgment stating very clearly that the principal duty and obligation to help rests with social services not with the homeless department. Now to return to the KHT letter. It does read as a veiled threat and infer that if you do not pay your rent then social services will be involved and that has been perceived by tenants as social services will take your children off you. I am not being cynical when I suggest this is a deliberate inference and intimidation from KHT to get tenants to pay by threatening them with the perception of having their children taken into care by SSDs if they do not pay their rent. Any KHT response which claims not to have meant this or not to have realised this standard letter would be perceived this way is either a lie or evidence of crass incompetence. Such as response holds no validity whatsoever so KHT cannot wriggle out of this by any such claim. At best this letter is chronic ineptitude and appalling judgment by KHT; at worst it is abuse – yes I mean abuse and not just being abusive. KHT should withdraw this letter with immediate effect and apologise publicly and apologise directly in writing to all the tenants that have received this standard letter. Social landlords are in a position of authority when it comes to housing matters. Tenants assume that landlords know housing law and good practice therein and tenants in large part have to trust social landlords. Social landlords also need the trust of tenants else their operation of the housing service and particularly their finances will take a massive hit in exactly the same way as any customer who does not have trust in their provider of good or services. This will happen much more so when direct payment of housing benefit is paid to tenants and not direct to landlords comes online with Universal Credit. Any landlord, wittingly or unwittingly that angers its customers the tenant and loses their trust is being incredibly foolish and especially given the direct payment welfare reform which sees tenants take control of the payment of rent and tenants having the ‘power’ which landlords now have and in this case abuse. If KHT do not immediately withdraw this outrageously inept letter and apologise for its wording and intimation publicly and in person to all tenants that have been stressed to death by receiving this letter then they deserve to get pilloried and deserve the high probability that tenants will pay less rent by de-prioritising it amongst their spending. I had seen a similar letter from South Ayrshire yet the KHT wording was far more insidious for me. However Giles Peaker on Nearly Legal blog has far more information on this than I have seen and makes an excellent case that South Ayrshire is worse than KHT – see here in a blog entitled Demanding money with menaces. What now must happen for me is that the KHT and South Ayrshire issues are massively shared and retweeted and then again and again to name and shame these outrageous behaviours from social (SIC) landlords. On that note reader, I have heard whispers this is not just limited to the two offensive landlords here so if you have more letters (which f course will be anonymised) that you want circulating as part of a naming and shaming campaign you know where to find me! Wirral letter exemplifies the unlawful conduct of councils in the bedroom tax…by its own hand!! This is unbelievable,terrifying parents who are already struggling to make ends meet.shame,shame,shame on them.What I would like to call them is unprintable. Addendum: there is NOTHING in the Homelessnes Act 2002 about provision for those who have “intentionally” made themselves homeless, hence that paragraph is in itself misrepresenting the Law – tantamount to fraud. The last paragraph represents a very real risk of children being removed into care – as this is one of the unwritten “threshold criteria” under the Children Act 1989 which triggers a section 47 investigation and section 31 proceedings, in some cases an application for an EPO. Seen it, worn the t-shirt. 1. It costs £800 per child in care. Common sense – in short supply when it comes to the bedroom tax – suggests that it would be cheaper for the council to pay DHPs to prevent eviction. A family with three children would cost them, for instance, £120,000 per annum in care. 2. Steve Webb, a half-wit Liberal Democrat MP in the Dept for Work and Pensions stated this year in Committee that people who were evicted due to bedroom tax arrears would not be regarded as having made themselves intentionally homeless. I completely agree that the wording of this letter is done poorly and could easily lead to a number of assumptions about children being removed if rent isn’t paid. They could have discussed the support available to those struggling to pay, or more information about how social services can assist them, not by removing children. However, being devil’s advocate, I think it’s important that they are honest and open with their clients and advise them if they are notifying social services, whatever the reason. ANother local authority doing the same. I’ve forwarded this to Private Eye – KHT need to be held to account as this is appalling. Yes back to the days of ‘Kathy come Home’ then? Why does EVERYONE keep calling them LAWS. There are NO LAWS in this country. The UK is a CORPORATION, a CORPORATION called UNITED KINGDOM PLC. It is a CORPORATION masquerading as a Government. And, because it is only a CORPORATION, it can only issue POLICIES, not LAWS. That’s why they are called ACTS, if they were laws they would be called laws. There is NO obligation to pay ANY tax whatsoever in any legislation they have issued. Write to the taxman and ask him for the PROOF or EVIDENCE that anyone needs to pay, he can’t because there is none. Trust me, it has been done, we have the evidence to prove it. Unless of course you CONSENT to it. So, do you work for UNITED KINGDOM plc, I don’t. Do you have to agree by it’s POLICIES, I don’t. Now let’s look at Knowsley Borough Council, they are a franchise, a PRIVATE LIMITED COMPANY. Check it out on Dunn & Bradstreet, Merseyside police are a OWNED by BT for god’s wake, wake up. It’s a scam. Ok, let’s look at McDonalds, McDonalds are a CORPORATION, do you have to abide by their policies. I don’t. Can McDonalds write LAWS! It’s all about giving YOUR CONSENT. This is not about Freedom of the Land, it is about uncovering this SCAM. Social Services are a department inside a COMPANY, how the hell can they take your children? EVERYTHING in this world is all about giving your CONSENT to a CONTRACT. It’s easy, JUST SAY NO!!! There are millions of people in this world waking up to this. Stop watching the s*** on television and reading the s*** in newspapers, get on the Internet and start learning. You believe everything THEY tell you. Stop, now!!! Check out the Strawman and your birth certificate and what they did to you and everyone. Start from there. The whole system is based on FRAUD, DECEPTION, LIES & MORE LIES. We have been conned!! WAKE UP. It’s a SLAVERY system, they try to control you by FEAR! Loose the fear, stand up to them. Well you’ve proven you’re a freeman and thus can safely be ignored. “tenants in large part have to trust social landlords” and the “T” in KHT supposedly stands for “Trust”. How absurd! The tenant would have received about 1/2 dozen previous letters – and ignored them. Also there is a provision under the children`s act , where a parent is intentionally being made homeless – the children must be protected, hence children’s services must be informed. To get to this point (the letter) about 6 months would have passed of ignoring the fact you live somewhere – you must pay for it! No! that makes Knowsley Housing Trust responsible for evicting you and making you homeless, so people should be suing Knowsley Housing Trust for the destruction of the family unit! lowering the rents may help the people who are really struggling to keep their heads above water.